Odisha is known for its magnificent temples and culture. The traditions and culture of people in Odisha is very old and unique. Oriya’s all over the world celebrate lot of cultural fairs and festivals. These Odisha festivals are an important part of Oriya culture and traditions. Odisha offer a perfect mix of religious, cultural and tribal festivals in India. People sing and dance on this cultural, thus representing a unique and colorful traditions. Rath Yatra and Durga Puja are the major oriya festivals celebrated worldwide. List of Festivals of Odisha is very long, but we have tried to cover each and every festival in the wonderful state of East India.There are a number of festivals , “Thirteen festivals in twelve months” a clearly justified saying there is in Odisha . 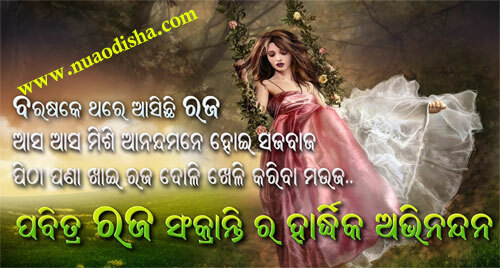 From this it can be derived that there is a huge list for Odisha festivals with the way of its celebration. There are festivals relating to numerous religion, culture, tribes, ancient temples, local shrines. An ethnic dance form and fanfare tradition with lots of pleasure, all dedicate to be a setting for the celebration. For best collection of Odisha ’s various festivals. the first day is called Pahili Raja,second day is Mithuna Sankranti,third day is Bhu daaha or Basi Raja.The final fourth day is called Vasumati snan. During these three days women and girls take rest from work and wear new Saree,Alata,and ornaments.Its similar to Ambubachi Mela. The most popular among numerous festivals in Orissa, Raja is celebrated for three consecutive days. Just as the earth prepares itself to whence its thirst by the incoming rain the unmarried girls of the family are groomed for impeding matrimony through this festival. They pass these three days in joyous festivity and observe customs like eating only uncooked and nourishing food especially Podapitha, do not take bath or take salt, do not walk barefooted and vow to give birth to healthy children in future. The most vivid and enjoyable memories one has of the Raja gaiety is the rope-swings on big banyan trees and the lyrical folk-songs that one listens from the nubile beauty enjoying the atmosphere.